RETRO KIMMER'S BLOG: SIMPSONS PRODUCERS AND HARRY SHEARER REACH AGREEMENT! 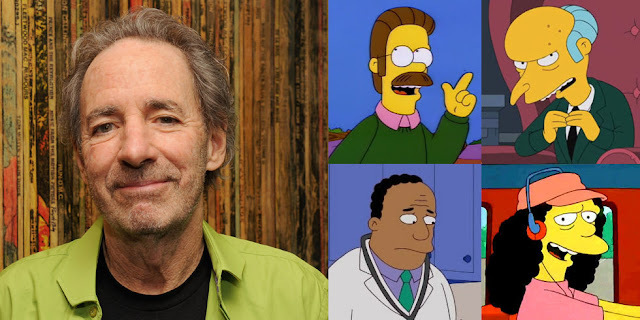 SIMPSONS PRODUCERS AND HARRY SHEARER REACH AGREEMENT! The Simpsons Harry Shearer signed a new 4 year contract with the Simpson's. Simpsons fans will find this turn of events nothing short of excellent: Seven weeks after tweeting that he was exiting the animated comedy, EW has learned that Harry Shearer—the voice of Mr. Burns, Ned Flanders, Smithers and a flurry of other memorable characters—has agreed to rejoin Fox’s forever-running animated comedy. Shearer has signed the same contract as did the other five primary voice actors—Dan Castellaneta, Yeardley Smith, Julie Kavner, Nancy Cartwright, and Hank Azaria—keeping the show’s original cast fully intact, EW has learned. These deals, which run for four seasons (including a network option for seasons 29 and 30), are estimated at more than $300,000 per episode. Fox recently renewed The Simpsons for a 27th and 28th season, which will bring its episode tally to 625.